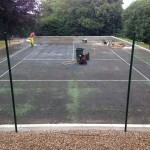 Our team carry out professional tennis court services including everything from full construction to painting and repairs. 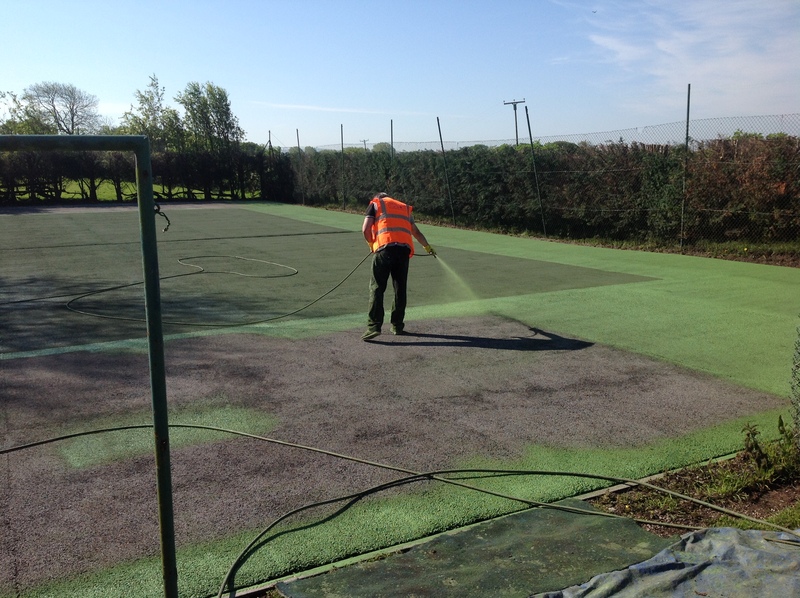 We are able to work with many facilities such as macadam, polymeric rubber and synthetic grass surfaces in the UK. Through working with various schools, clubs and homeowners we have developed a specialist knowledge in this industry and complete these projects to a high standard. Please fill in our contact form to speak with an expert today and get more details on all of the products and services we have to offer. One of our friendly staff members will talk you through everything and provide a quote which is suitable for your budget. What is an Artificial Tennis Court? 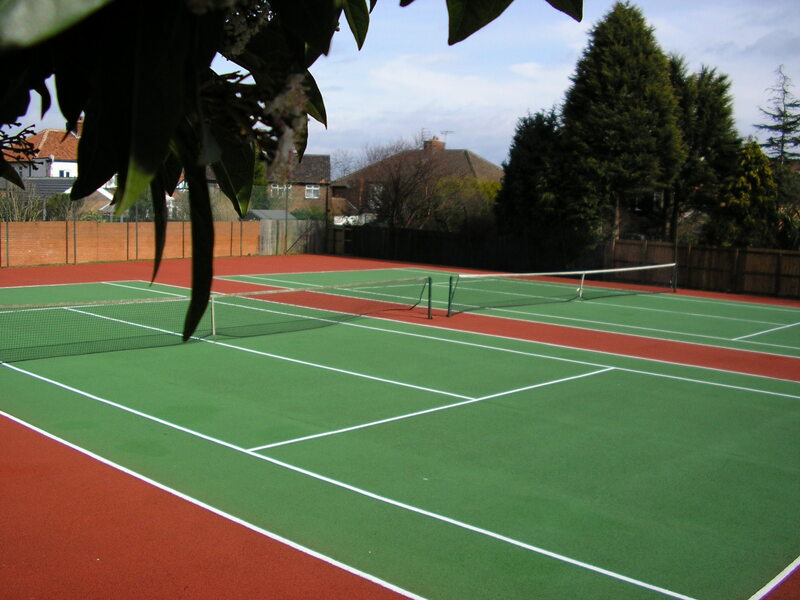 An artificial tennis court will usually be made out of surfacing like tarmac, polymeric rubber or synthetic turf. Each of these specifications offers an alternative to natural grass, making facilities more durable and less likely to become waterlogged. 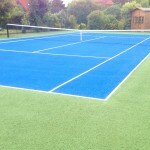 The tarmac and rubber surfaces are used for hard courts, and can be painted with brightly coloured anti slip coatings to enhance playing qualities. Synthetic turf is designed to offer a more natural feel, but it is easier to maintain compared to a real grass facility. We offer all of these options when building new sports courts or renovating existing ones. 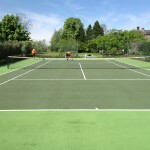 The tennis court surfacing specification you choose depends what sort of playing qualities are needed, and whether the area will be used for recreational or competitive games. As specialists we’ll be able to advise you on the right products for your facility. If you are thinking about building a completely new sports facility at your school, club or home, we are here to help. The tennis court construction work can be completed by our skilled team, and we’ll take care of every stage of the work. We’ll carry out groundworks and installation of the surfacing itself, along with any additional features like perimeter fencing and floodlights. The costs of installation and other tennis court services will vary from job to job, depending on the dimensions of the area and the chosen specification. The sizes of a sports facility may vary, for professional use the court must be a specific size, however if the surface’s primary function is recreational play the dimensions can be smaller to help keep costs down. Once the initial installation is complete, we’ll apply coloured paint coatings to macadam and polymeric surfaces to ensure the best finish. 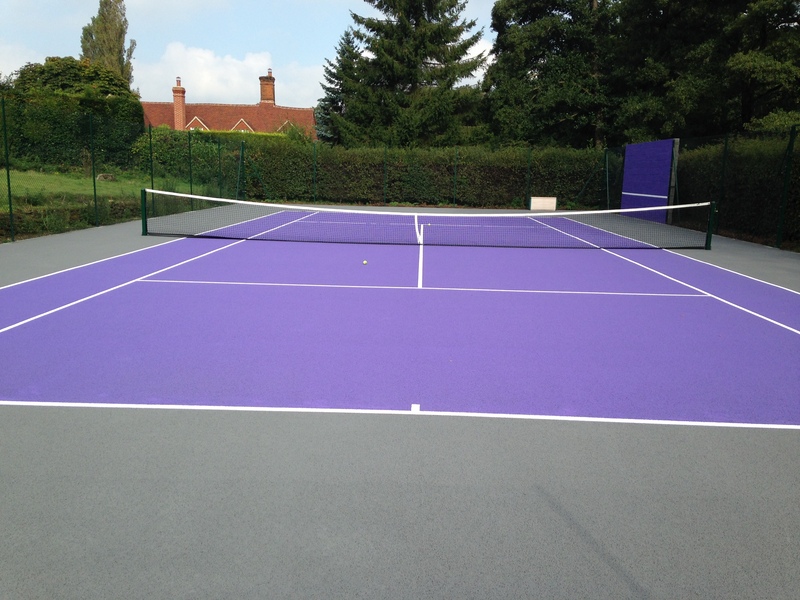 This tennis court painting process adds slip resistance to the flooring to enhance safety and give better grip for improved performance all round. An acrylic coating will typically be applied to the tarmac surfaces, whereas the rubber courts typically have polyurethane paint. Both of these are available in a selection of bright colours so you can make your facility stand out with a unique design. 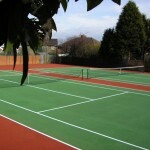 We will also apply tennis line marking to the area in a contrasting colour so that they are clear to see. This can be done just for the one sport, or more lines can be added for different activities like basketball and netball. Many schools choose this option to create a multipurpose facility if the space will mostly be used for recreational purposes. We offer maintenance services, this makes sure that any contaminant such as moss, algae or general debris can’t seriously damage the playing characteristics or have any long term effects on the product life. The costs of tennis court maintenance can also vary and are dependent on the overall condition of the surface. Sports surface testing can be carried out to assess the performance and safety qualities of the flooring and to determine an appropriate maintenance plan. A well maintained sport surface will need regular pressure washing and brushing to keep it in top condition, keeping the surface well looked after can cut costs. However, if the facility is in very poor condition then more maintenance and repairs will be required; these tennis court services will of course be more expensive. The cleaning is done with a special chemical agent that makes the court look brand new. When we do cleaning jobs, we tend to do re-line marking as well, this puts a new coating of acrylic anti-slip paint onto the court making it as good as new. 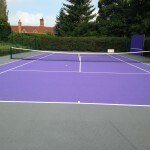 To avoid the costs of having your court repaired or resurfaced, it’s important to make sure that you properly maintain your facility to a high standard. We offer a maintenance service that can help keep the flooring in shape and fully maximise the product life. However if you haven’t been taking care of your facility, we also offer surface repairs as part of our tennis court services to make sure that your court is safe to use and that your game isn’t ruined by an unsuitable surface. Check out the video above of our team carrying out a full clean and repaint for a tennis surface. The existing flooring was dirty and covered in moss, so a thorough jet wash was needed to remove the contamination. A new coating of paint and line markings were then applied to improve the appearance and create better playing qualities. In many cases a sports surface may become damaged, particularly with frequent use over long periods of time. Without regular maintenance this can happen more quickly, so it’s important to take care of the surface. 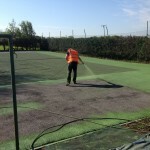 If you do notice any problems, it’s recommended that you carry out reactive tennis court repair as quickly as possible. Cracks may start to appear on tarmac courts, and we are able to fill these in using an emerald stone mixture. The same issue could happen with a polymeric rubber court, and these cracks can be filled with a new application of rubber mix. If you have an artificial turf area, you may notice rips in the carpet or the surfacing might start holding water. These issues can be rectified by replacing the damaged section of carpet, and carrying out a tennis surface rejuvenation to remove contaminated sand and prevent flooding. 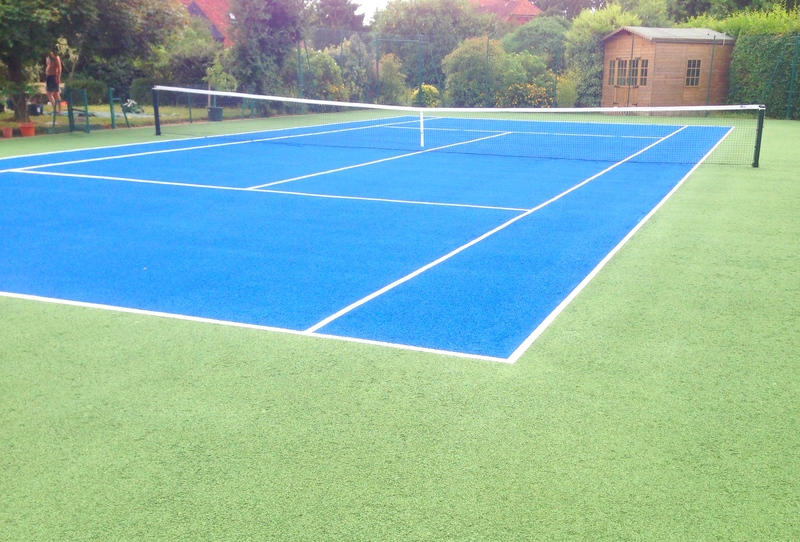 There are different services available for each type of surface, whether you have a polymeric, macadam or artificial grass court, you can choose the works based on the requirements of your facility. Lots of our clients choose to have extra features added onto tennis courts to make them more efficient. One of the most common products is fencing which is available in a number of designs and heights. 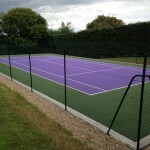 This can be designed and fitted to suit the correct tennis surface dimensions whatever the size of your court. The chain link option is perfect for many recreational standard pitches, but a super rebound specification is also available as a more robust product. If you are a club wanting to create a professional standard court which gets a lot of use, the super rebound fence would be ideal for you. Specialist tennis floodlighting is also available if you want to extend the usage hours of your facility. These can be fitted in many different styles and they allow you to carry on using the area after daylight hours. This is great for anyone who wants to rent out their court in the evenings for use by other teams and clubs to generate some extra income. You can fill in the contact form on this page if you would like to speak to one of our team members about any of the tennis court services. We’ll be able to provide you with some more details on everything we do so don’t hesitate to ask. Our experts have worked with many clients including schools, clubs and individuals to complete this work. We would be happy to send over further product sheets and information on costs for your project if you include an area size and post code. Just fill in the contact box on this page to speak with us about your project today. 1 What is an Artificial Tennis Court?